All three of these stocks jumped by double digits this week. Here's what you need to know. In a week when the S&P 500 traded approximately flat, two notable tech stocks jumped and one soared. Social network Twitter (NYSE:TWTR) saw its stock rise more than 11% during the week as shares surged to a new three-year high. Shares of electric-car company Tesla (NASDAQ:TSLA) added to gains earlier this month, rising 13% during the week. Online marketplace Etsy (NASDAQ:ETSY) skyrocketed a total of 28% during the week on news of the company's new fee structure. Here's a closer look at what's behind each of these companies' big moves in their stock prices. Optimistic analyst commentary on Twitter stock earlier this week likely was one of the reasons for the stock's 11% gain during the week. 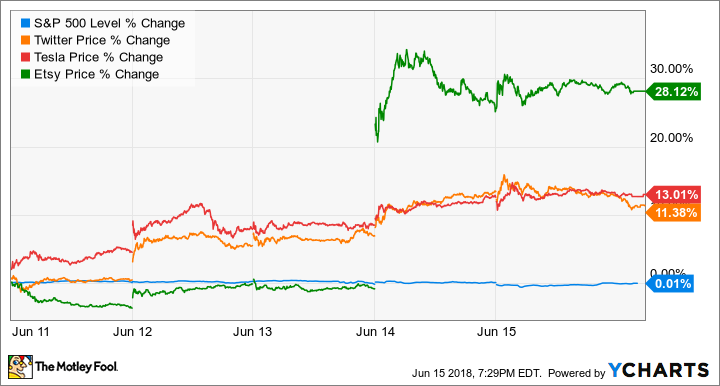 "We are raising our estimates on TWTR shares as we believe advertising momentum is strengthening, particularly among large marketers," said JPMorgan analyst Doug Anmuth on Tuesday (via CNBC). Anmuth cited improvements for users and marketers and strong growth in daily active users as reasons he's optimistic. The analyst raised his price target for the stock to $50. In Twitter's most recent quarter, the company swung from a loss of $0.09 in the year-ago quarter to earnings per share of $0.08. On a non-GAAP basis, earnings per share (EPS) improved from $0.07 in the year-ago quarter to $0.16. Revenue and daily active users increased 21% and 10%, respectively, year over year. Twitter has surged over the past year as the company proved it can reinvigorate user growth while cutting costs and improving its advertising products. Shares are up a total of 174% over the past 12 months. Electric-car company Tesla continued to rise this week for a number of reasons, including layoffs aimed to help the automaker achieve profitability, Tesla CEO Elon Musk's open-market purchases of $25 million worth of Tesla stock, and an overall bullish trend ever since Musk forecast earlier this month that Tesla likely will achieve its ambitious production and profitability targets. Model S. Image source: Author. But one of the most interesting announcements from Tesla this week was that the company is planning for some major updates for Autopilot. Tesla will release Autopilot version nine in August, Musk said on Twitter this week. Coming about two years after version eight was released, one of the updates included in version nine will be the first release of some features for its Autopilot tier called "full self-driving capability." "To date, Autopilot resources have rightly focused entirely on safety. With V9, we will begin to enable full self-driving features," Musk explained on Twitter. Another likely feature to be included in version eight will be assisted driving from highway on-ramp to highway off-ramp -- a capability Musk has said should be deployed within the next few months. Online marketplace Etsy took the market by surprise this week when it increased the fees it charges sellers from 3.5% of sales to 5% of sales. Incremental revenue generated from the higher fees will be reinvested into Etsy's business. "We plan to increase our 2017 direct marketing spend by at least 40% in 2018, revamp our Etsy community platforms, and execute against an exciting product roadmap," explained Etsy CFO Rachel Glaser. "We believe all of this will help drive near-term growth and increase buyer lifetime value." In addition to hiking its fees, the company also launched two new subscription tiers for sellers to get access to more tools, customer support, and services.